Nanking, Or Nankin (i. e., the " southern capital," in distinction from Peking, the " northern capital"), called also Kiangnixg-fu, a city of China, the chief town of the province of Kiangsu, and the residence of the governor general of the three provinces of Kiangsu, Nganhwui, and Kiangsi, about 3 m. S. of the Yangtse-kiang river, about 200 m. from its mouth, 560 m. S. by E. of Peking, and on the grand canal connecting Canton and Peking, in lat. 32° 2' N., Ion. 118° 49' E.; pop. estimated before the Taiping rebellion at 400,000 or more, but now probably much less. The river opposite the city is 1½. broad and 25 fathoms deep, with a rocky bottom, and a current of from 3 to 5 m. an hour. The region about the city is very marshy, and the excessive moisture makes it unhealthy for Europeans and natives of other provinces. The remains of ancient walls have been traced for a circuit of about 35 m. The modern walls are about 40 ft. high and 18 m. in circumference, and enclose a space of which not more than one eighth is occupied by the town. On the W. side they are strengthened by a deep ditch from the river. The great extent of the walls makes them difficult to defend, and the city is overlooked by the hills on the east. The eastern part of the city is irregular and thinly inhabited, but in other parts the houses are so closely packed that one looking from a high building over the tent-like roofs of the temples can scarcely trace the streets. The Mantchoo and Chinese parts are separated by a cross wall. The principal streets are of moderate width, and were formerly lined with handsome shops. Most of the buildings of former note have been destroyed. There is a curious square tower 50 ft. high, on the top of which is a finely sculptured figure of a turtle, carved from a single block of marble. Not far from the walls is an ancient cemetery, which travellers have called the tombs of the kings, approached by an avenue of colossal figures. At some distance from these statues are rude colossi of horses, elephants, and other animals, without regular arrangement, and perhaps removed from their original places. The celebrated porcelain tower was destroyed by the rebels. It was built in 1413-'32, and was of an octagonal form, 260 ft. high, in nine stories, each adorned with a cornice and gallery, and covered with a roof of green tiles, with a bell suspended at each corner, which sounded when moved by the wind. On the top was a pinnacle in the shape of a pineapple, surmounted by a gilded ball. A spiral staircase led to the summit. - j Before the accession of the Mongol dynasty the court sometimes resided at Nanking. The first two emperors of the Ming dynasty also resided in it. It was taken by the Mantchoos in 1645, and continued to be a very important city, famous for various manufactures, especially for the cloth called from it nankeen. It was invested by Sir H. Pottinger Aug. 14, 1842, and the treaty with England was signed there Aug. 26. It was taken March 19, 1853, by the Taiping rebels, who tried to establish there the ancient " heavenly empire." They held it for 11 years. During this occupation a collision with the British ships under Lord Elgin led to a bombardment of the city, which ruined the Chinese batteries. On July 19, 1864, it was taken by the imperialists, who sprung a mine of 68,000 lbs. of gunpowder under the wall, and entered through the breach. They found the rebel emperor dead by suicide, with most of his higher officials. More than £2,000,000 of treasure was found concealed in the palace. Since the imperialist occupation there has been some attempt to restore the former manufactures, but with little success. The governor general has established a manufactory of shot and shell. The business part of the city is being gradually restored. There is little or no foreign trade; and though the city is a free port, few foreigners reside there. 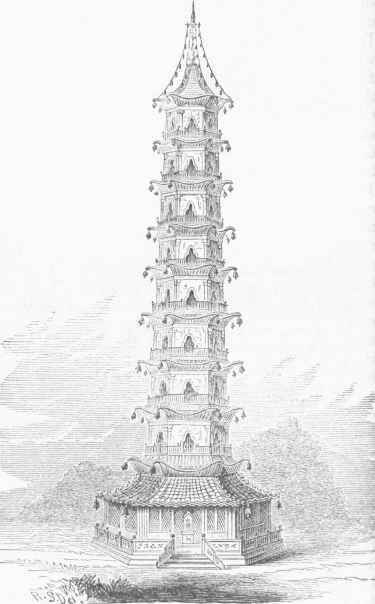 Porcelain Tower (destroyed by the Taipings).